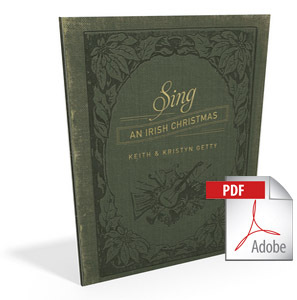 Ireland’s Keith and Kristyn Getty, writers of modern hymns and carols, celebrate Christmas with their sixth annual tour of Sing! An Irish Christmas. As seen on public television, the Gettys are joined by their band of instrumentalists, fusing Celtic, bluegrass, Americana, and classical music as well as cultural dance and the choral sounds of the holiday. Keith and Kristyn will be joined in various cities around the country by special guests such as Joni Eareckson Tada, David Platt, Alistair Begg, Ricky Skaggs, David Crowder, Fernando Ortega and many others, combining tradition and innovation into a vibrant celebration of the season! To commemorate this monumental event, we have created a keepsake program book that will be available at all of our concerts. This booklet is filled with beautiful commissioned art, inspiring stories and articles from the Gettys and others, messaging from some of our favorite ministry groups and organizations, and is designed as a hymnal to help concert goers sing along with Keith & Kristyn at the event and take back to their churches and homes to sing with for years to come. CLICK TO FIND A CONCERT NEAR YOU! Follow the links below to download the complete keepsake program booklet OR view it online in our NEW interactive viewer to take advantage of special offers mentioned in the book!